French Polynesia is located halfway between Los Angeles and Sydney in the South Pacific. Papeete is the major city and site of the international airport. there are three major island groups: the Society Islands (Tahiti, Moorea, Huahine, Raiatea, Maupiti and Bora Bora); the Tuamotu atolls (Rangiroa, Manihi, Mataiva and Fakarava); and the Marquesas islands. French Polynesia is scattered over 1.5 million square miles of ocean in the eastern south Pacific. It is 10 hours behind Greenwich mean time, 2 hours behind US Pacific Standard time (PST), and 20 hours behind Australian EST. French Polynesia is accessible by air from most parts of the world. Air Tahiti Nui, Air New Zealand, Air France, Qantas, AOM French Airways, Corsair and even Hawaiian Air serve FAAA International airport. inter-island connections are mostly by Air Tahiti with jet service even to the outer islands. Travel from the west coast of the United States is primarily from Los Angeles. corsair flies out of Oakland and Air New Zealand provides United Airlines connections from San Francisco. There is no departure tax in French Polynesia. Luggage weight restriction may apply especially on inter-island flights. Cooled by gentle Pacific breezes, French Polynesia is sunny and pleasant. November through May is warmer and humid, while April through October is cooler and drier. Most of the rain falls during the warmer season intermixed with sunny days and refreshing trade winds.The drier months are better for diving. Dress is casual and lightweight. The average temperature of the ocean is 26C during the cold season and 29C during the hot season. You can dive without a wet suit but a thin shin is helpful to protect both your skin and marine life from damage. Except during the rainy season, visibility usually exceeds 30 meters. 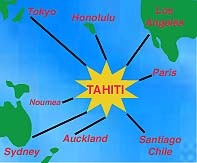 French and Tahitian are spoken throughout the islands. English is spoken in resort areas but is little used in the outer islands. Use a good sunscreen and do not overexpose your skin to the tropical sun. Tennis shoes or plastic sandals are recommended when walking on the reefs and in the lagoons. Although extremely rare, poisoning may occur when barefoot swimmers step on the toxic spines of the stonefish. Mosquitoes are a nuisance especially in the rainy season, use citronella oil and mosquito coils. Malaria protection is not necessary anywhere in French Polynesia. "No-see-ums" (nonos) may also be a problem on some islands. There are no snakes, poisonous spiders or fearsome animals in these islands. The currency in Tahiti is the French Pacific Franc (CFP), though credit cards and US dollars are common. Though exchange rates vary, are approximately 130 CFP to the U.S. dollar. Offices and shops are usually open from 8am-noon and 1:30 -5:30. Monday-Friday (also Saturday mornings). Banking is from 8am-3:30pm, with branch offices remaining open until 5pm. Major hotels will exchange money although the rates may be higher. Access to Web-based email is available at cybercafes on Tahiti, Rangiroa, Moorea and Bora Bora. Direct access is available through the phone company by dialing 0368888 (user name & password set to "anonymous"). There is no charge for access but you must pay for the long distance charges. Calls can be placed from your hotel room with the correct connector. French Polynesia produces the most sought after south seas black pearl from the "Pictada margaritifera" oyster. nurtured in the warm-water lagoons such as Manihi, Rangiroa and Fakarava, these jewels embody the beauty, magic and charm of the South Pacific. 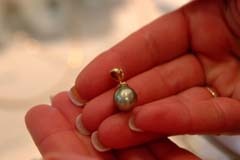 Black pearls come in a variety of shapes, from perfectly round to pear shaped to baroque. colors range from pure black, green, aubergine, blue-tinged, reddish-bronze, steel gray, pinkish and even white. one of the most sought after colors is iridescent green known as "fly's wing" with spectacular luster. the best prices are obtained in the outer islands where the oysters are framed, along roadside shops and through small independent sellers. 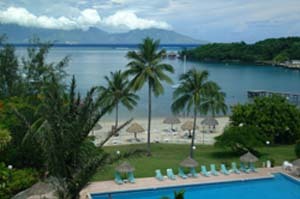 major hotels, large pearl farms and in Papeete generally offer high-quality settings that carry prices several times more than can be obtained through small distributors. Woodcarving is done mostly by men employing local hardwoods such as "tou," a variety of purple wood, and "miro," a local rosewood. ancestral graphic and symbolic designs adorn spears, war clubs, "umete" or fruit bowls and other serving utensils. the marquesans excel in woodcarving and provide many opportunities for the collection of travel gifts. Whether it is a hike to volcanic pinnacle, along an isolated beach, through a jungle path or a stroll to town for shopping or croissant and coffee, photo opportunities await around every corner. bring plenty of film (or disk space), sun screen, water, lightweight hiking shoes and maybe a sweat band or two.